DH – In July 2018, after 9 years at the helm Vern Burkhardt stepped down as Event Chair of the Swiftsure International Yacht Race. It was a great time to go as Vern was offered the opportunity to spend 5 months cruising from the Caribbean through the Panama Canal and eventually back to Victoria. Being of sound mind, and an ocean sailing fanatic, he took it. As is often the case, one change led to another and a number of the 2018 Committee members chose to move along as well. While the same crew remains on the Race Management part of the organization, many of the ‘shore-side’ members turned over. While Vern is staying on as ‘Special Advisor’, Past RVYC Commodore (and former Swiftsure Principal Race Officer) Andrew McBride has taken on the role of Event Chair. Mike Cowley remains as Race Director, John Abel as Principal Race Officer and Dennis McMillan as Technology Coordinator. New members include Brian Shorter as Logistics Coordinator, Deb Tolman leading Sponsorship, Louise Alepin with Media Relations, Peter Testemale as Volunteer Coordinator, Ann Steele as Registrar and Guy Tyrwhitt-Drake with Trophies and Awards. While things have been a bit slow getting off the ground for 2019, they are well under way. The ‘new blood’ on the Committee is working hard to introduce a number of changes to the ‘shore-side’ activities to streamline processes with the objective of increasing the positive experience for racers. Registration for the 76th Swiftsure International Yacht Race began with a bang! Keith Climenhaga’s Dilligaf registered moments after the system opened. Keith has raced a number of Swiftsure’s double-handed and extends an invitation for others to join in racing Juan de Fuca Monohulls for 2019. Next to register was Mata Hari. Current owner Jeff Blyth and previous owner Paul Walchenbach have raced Mata Hari in numerous Swiftsure races through the years and has won in the Cape Flattery Race. Chuck Stephens’ Panic leads the pack of J105 boats, where they arrange to register and race at least 5 of the J105 fleet, establishing their own division in Cape Flattery, it’s a great way to race together and is possible for any design. There’s a very active racing schedule throughout the year in the J105 Pacific Northwest Fleet. Darkside, the previously named and successfully campaigned Schock Therapy, will race her second Swiftsure in Cape Flattery Race. She is actively raced throughout the year under skipper Nicholas Leede. Gusto, a Swan 441 will race Cape Flattery with Swiftsure’s first female skipper to register – Beth Miller. Gusto also raced Swiftsure, Pac Cup & RTC in 2018 as well as Seattle races. Mephisto, Peter Mill’s C&C 29, is the first Royal Victoria Yacht Club boat to register to race Swiftsure. She will race the Inshore Flying Sails race with all-original equipment. Each year, as a standing committee of the Royal Victoria Yacht Club, Swiftsure International Yacht Race is required to provide a report to the club’s board of directors. In the report, much is acknowledged. Racers from throughout the Pacific Northwest and beyond reconnect with each other at Swiftsure. Being the largest race on North America’s West Coast, Swiftsure may be the one race each year when racers see each other and get great competition. About half of the yachts racing in Swiftsure are from the United States of America. So much goes into making Swiftsure successful. Several levels of government, including U.S. Department of Homeland Security & the U.S. Coast Guard, Canada’s Royal Canadian Navy, Royal Canadian Air Force, Canadian Coast Guard, Joint Rescue Coordination Centre Victoria. Plus the City of Victoria, Greater Victoria Harbour Authority. Volunteers from the Royal Canadian Marine Search & Rescue auxiliary crews of units 33, 35, and 37. Sponsors help us in so many ways, from donating funds to assist with the race costs, through allowing us the use of their assets such as UK Sailmakers Northwest RHIB and Prince of Whales Whale Watching’s Ocean Magic II plus a RHIB. Also contributing to Swiftsure’s Silent Auction. Through sponsors’ support, plus registration fees the racers pay and a few other sources, Swiftsure is financially self-funded each and every year. Volunteers – almost 200 of them – help put the race together like a giant jigsaw with not a single piece missing. From the Event Chair right on through to the Soup Servers, every single one is a volunteer. And yet, it’s nothing without racers and their yachts. The decision to race is made in the dark of winter. Skippers and crew work through the cold and bluster to ensure the boat is ready and meets the rather rigorous race requirements. Safety is top of mind for them, just as it is for the race organizers. Swiftsure can be anything – from light zephyrs, to ripping gales, and sometime during the race will be the perfect conditions for each boat to find her groove. Here’s Vern Burkhardt’s final report to the RVYC Board of Directors – 2018 was his last year as Swiftsure’s Event Chair. Enjoy the read. Ron Rosenberg raced his first-ever Swiftsure aboard Le Reve. Far from his first racing experience, Ron has raced since he was 9 – starting with a Sabot (gosh, how many of us have) through 5 world titles on Solings, Etchells, J-24s, 5.5 metres, and the ISAF Youth Worlds. Deep, deep, deep yacht racing. It’s now in the books, winds have subsided, and we’re on to summer adventures with the sweet taste of the 75th Swiftsure lingering. This year of firsts was as close to perfection as one can get. Dry skies, from sunshine blasting down on the Thursday Racers’ Social at Prince of Whales Whale Watching’s Ocean Magic II, where the new Spinnakers Swiftsure Amber Ale and Mount Gay Rum Dark & Stormy cocktails flowed freely, through the last race boat to finish on Monday at 04:49:03, the all-women Geminis Dream. In between, Mike Turner presented the Swiftsure 2018 Race Start seminar in the Distrikt to a large crowd with great questions, with big plastic sailboats ready to sail around the dance pit, giving visuals some impact. The fast-paced Awards went smoothly, leading into the Skippers’ Meeting, where the combination of predicted strong westerly winds and flood tides had skippers strategizing their route toward and beyond Race Passage, considering starting with a reef. That evening, all the stops were pulled out as the first-ever Dock Party was held, Spinnakers beer sold and The Midnights performed well beyond their planned 9 PM. Marianne Scott has written numerous and varied articles for Pacific Yachting through the years. This May 2018 article shines a light on Swiftsure’s origins, going back to the first race in 1930, where the commodores of the Seattle and Royal Vancouver Yacht Clubs were sharing a drink at the Royal Victoria Yacht Club with the commodore. The conversation wandered toward racing, a few drinks and chats later, they’d decided a race challenge should be held. 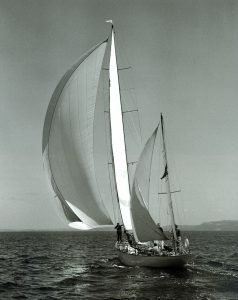 This was the birth of the Swiftsure International Yacht Race. For the public, there are many opportunities to experience the historic 75th running of the Swiftsure International Yacht Race – and it’s all free! 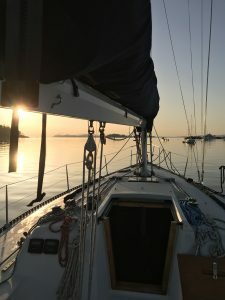 On Thursday, May 24th, at the Causeway Docks of Victoria’s Inner Harbour, watch as yachts begin to arrive in the afternoon, and chat with the racers on the docks. Friday, May 25th until 6 PM, walk the docks and, later in the afternoon, have your picture taken with Captain Jack Sparrow & Scarlett as they swash buckles. Make this the year you participate, celebrate and purchase historic 75th Swiftsure memorabilia and clothing at the tent at the top of the Causeway Docks. On Saturday, make your way to Clover Point for 8 AM. There will be a pancake breakfast available from the Central Saanich Lions Club, while Swiftsure Commentators Michael Nusbaum and Daphne Goode share race information with the public over a PA system. 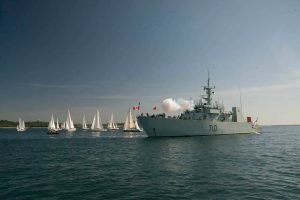 At 9 AM, a large gun blast and puff of smoke from the bow of HMCS Nanaimo will signal the first of six race starts. Each 10 minutes, a new race start is announced in the same way. 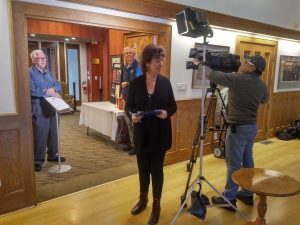 Today, Shaw TV South Vancouver Island released the video they created and produced over the past year with a devoted group from Shaw TV’s production crew and Swiftsure International Yacht Race volunteers. We are very excited to present this historic video. The Swiftsure show will air on Shaw TV and Blue Sky the following times starting May 7th – May 27th. If you want to know the key people from Shaw TV that made this happen, you can look to Daphne Goode and Orlando Carillo. Without their dedication and persistance, this video would not be what it is. A wonderful chronicle of the proud history of the Swiftsure International Yacht Race. Katie Ford was designed and built by Mr. Heine Dole at Astoria Marine Construction in 1946. During the Second World War, Astoria Marine was given the right to accumulate all the old growth timber they could get to build ships for the US Navy. When the war ended, there was a lot of timber left, so Heine decided to use some of it to build Katie Ford. Writer and mariner Marianne Scott has created this informative article about Swiftsure through the years. Marianne brings to life the Swiftsure race of days gone by, contrasted with the experience of yacht racing today. Technology has changed, Victoria’s Inner Harbour has changed, the boats and sails have changed. What has not changed is the challenge of racing Swiftsure. Currents, winds, tides still bedevil the most experienced yacht racers. They return again and again, testing their mettle against the elements, competing for coveted trophies and creating a lifetime of memories.